"Grandma, how much basil did you put in there?" "This much" as she held out her hand to show me. "Well, how much is that?" So it is with much relief that I was able to record her recipe for Pumpkin Pie because my Grandma made the best Pumpkin pie ever. We've adapted it for the bakery and we are pretty sure our customers agree! This time of year brings back memories of all the Thanksgivings spent just looking forward to that pie. Now everytime I see a Pumpkin pie it reminds me of her. Thanksgiving was always one of my favorite holidays. Even as a kid, I chose Thanksgiving over Christmas. What's not to love? It's a day about food and family, not "things". It's centered in my favorite season: fall. It's a day long gathering to share and talk. When I was little I always loved waking up in my Grandparents' home to the smells of the turkey already cooking, knowing that soon I could watch the parade and greet family. Spending the day laughing and conversing (honestly that yelling was just Italian conversation). But my favorite part? The dessert. My Grandpa would make the coffee and as it brewed and the pies and cakes were brought out, everyone awakened from naps and lounging to gather once again around the table. Pumpkin pie, Pecan pie, Apple pie, Maple cake and more. Dessert plates were filled with "one of everything" and the coffee was endless. Priceless memories. The next day, eating a slice of that Pumpkin pie for breakfast was just pure heaven. I started to host Thanksgiving dinner many years ago. Thanksgiving is also our second busiest time at the shop (anyone have a guess at the first?) Surviving both requires a lot of preparation. My list is made weeks in advance, the table set days ahead of time and anything that can be prepped is prepped before the big day. I never save shopping for the day before, rather I try to avoid the stores that week if at all possible. My Thanksgiving morning starts out immensely early in order to get the bird in the oven. I always cook a big turkey no matter how many people are coming so that we have lots of leftovers. And yes, I always put the stuffing IN the bird. I have tried it without and decided that my Grandma did it the right way by putting it in AND by basting periodically. It makes a big difference in flavor. I like to have the biggest dishes prepped and underway so that I can enjoy being with family when the parade starts. When everyone else awakens or arrives I have scones and Do-cups setting on the counter to get them started. 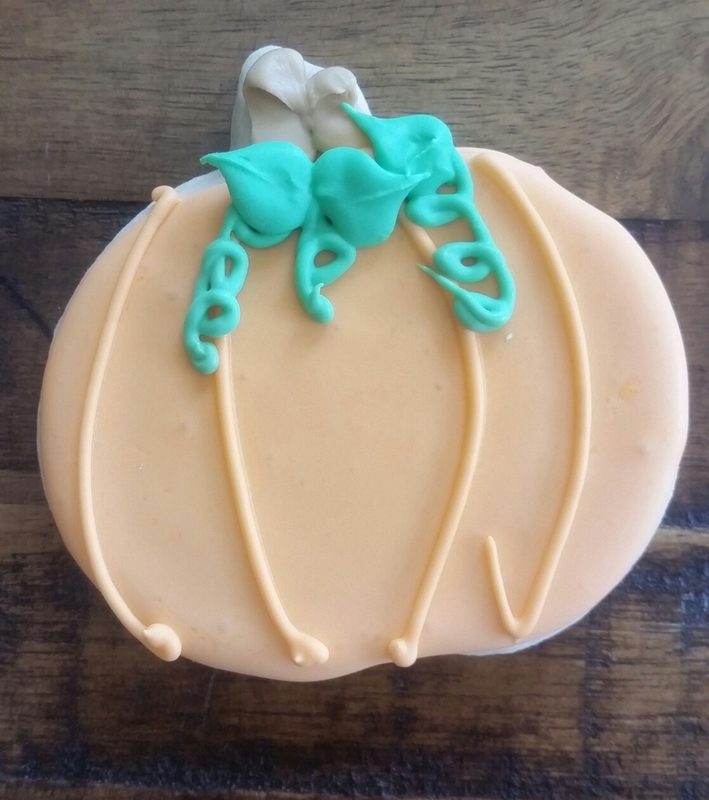 This year we will have our Pumpkin scones---a great seasonal flavor with a cup of coffee. Any leftovers will come in handy when we awaken early the next day for shopping and decorating. Next, I always prepare hot apple cider and an appetizer tray to munch on while we wait for the big feast. Positioning the tray in the kitchen keeps family nearby for conversation. Appetizers are small bites consisting of olives, blue cheese drizzled in local honey and baguette drizzle with hearty olive oil. Everyone helps to look in on the turkey throughout the day and to prepare the side dishes. Carrying on with tradition, we always have pasta as well. In our family it is wide and long macaroni noodles covered in pork sugo. Dinner is served on my husband's grandmother's china. This year we will have Sugar Cookie "place cards". The best time for me is dessert. I display our desserts on the sideboard throughout the meal so family can dream about what they are going to dig into first. There are always two Pumpkin pies because Pumpkin pie for breakfast the next morning is one of my favorite things. There's always an Apple pie (my Dad's favorite) and a Chocolate pie (my kids' favorite). The cake changes every year. This year I am pretty sure it's going to be Pumpkin Spice (yum!) Oh, and plenty of coffee as well as champagne cocktails. Our Pumpkin Spice cake is a show stopper. Thanksgiving is filled with family traditions. What are yours? Nina and I are so grateful to our customers, vendors, and business friends and we wish you all a very blessed holiday. We will be giving thanks for each of you when we say grace with our family. By the way, don't forget to place your orders!